...and it won't even cost $400!! Today's nails were inspired by the Grateful Dead bears! :) Gotta love them in their colorful goodness, so I thought they'd make fun nail art!! I used Sally Hansen Professional Lavender Cloud as a base, with Pure Ice French Kiss mixed with Orly Gumdrop for the blue bear, and highlighted with Orly Gumdrop as well. For the neck, I used For the green bear I used L.A. Girl Army Green, highlighted with CND Bicycle Yellow, and a mixture of China Glaze Salsa and American Apparel Manila for the neck. For the yellow bear, I used American Apparel Manila, highlighted with American Apparel Cotton, and Pure Ice French Kiss for the neck. For the red bear, I used China Glaze Salsa, highlighted with CND Bicycle Yellow, and L.A. Girl Army Green for the neck. For the purple bear, I used a mixture of China Glaze Salsa, Pure Ice French Kiss, and Sally Hansen Professional Lavender Cloud for the body, highlighted with Sally Hansen Professional Lavender Cloud, and Orly Gumdrop for the neck. Everything was outlined in American Apparel Hassid. Topped everything off with two coats of Seche Vite top coat. can you please do some disney nails, Mickey and the troop maybe? Wow, they are posed just like the real bears, that is amazing tiny technique. Takes me back to Haight. I love this little bears. you are an artist! Your nail arts are always perfect! This is the cutest thing in the world! Best mani ever!!!!!!! Love The Dead! You are sooo talented! Im hooked on your blog, big time. I wish you could post ten times a day!!!!! Lol! I love these! Not a Dead Head but loving the nails for sure, they are perfect! This is so, so fantastic. I am absolutely amazed at the detail you manage on such a tiny canvas. I became a follower! It took me a bit to figure it out but I didn't want to miss any of your blog. Anyways, it was great seeing you as well! Those burgers were to DIE for. Hopefully I'll get back out to Vegas sometime soon (when it's not so hot). 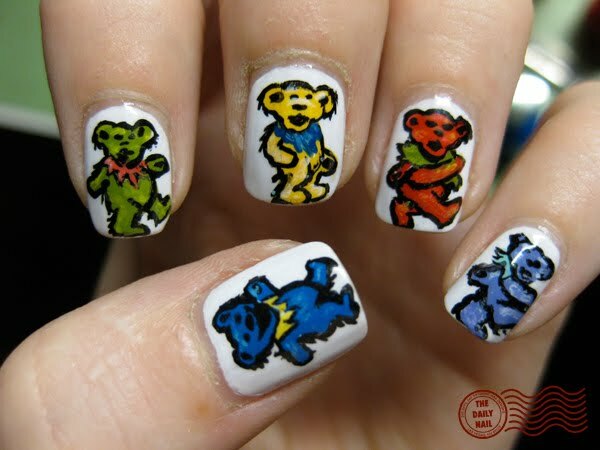 LOVE LOVE LOVE the nails that night (the Greatful Dead Bears). Your followers definitely have to see them to believe it. AMAZING! Have a good one chica! A few days late... I LOVE these! I'm a huge DEAD fan and saw them many times at UNLV. These are really fun!